Dr Gilbert Price, a paleontologist at the University of Queensland, is working with a team of 10 fellow scientists dedicated to solving the prehistoric puzzle of north Queensland. "There is so much cool stuff out there that can inform us about past life and climate change," Dr Price said. "It is only a matter of time before we identify entirely new creatures." 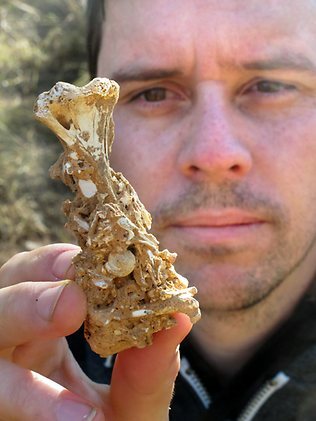 Dr Price has obtained specimens of the quinkana, an extinct land-based crocodile; a giant carnivorous kangaroo, propleopus Chillagoensis; the 3000kg rhinoceros wombat, diprotodon; giant flightless birds; and carnivorous marsupials such as a Tasmanian tiger once the size of a female African lion. Some are preserved in stunning detail, including a fossilised crocodile skull in Tea-Tree cave, the best of its type in Australia, and skeletons of giant Pleistocene snakes that may be the precursor to the Rainbow Serpent myth. "It is a bit of a tenuous link between the fossil record, Rainbow Serpent and earliest humans," Dr Price said. He said previous finds of a giant snake, wonambi, were extinct at least 20,000 years before the first humans turned up in Australia, with no evidence of an overlap "either in time or space with the big guy". 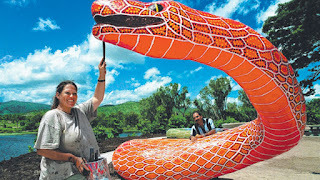 Dr John Scanlon, who found two prehistoric snakes, including Yurlunggur at Riversleigh in the Gulf Country and described them in Nature in 2006, said it was tantalising to think of more snake fossil records turning up. "Serpent myths are universal, but whatever way you look at it, the world was a far more interesting place with giant snakes in it." More than 600 cave systems have been "tagged" in the Chillagoe area, west of Cairns. The longest surveyed cave is 14km long and the deepest is 100m underground, but there are thousands more north and south. It is a series of sink holes and chasms extending more than 600km on what is reputedly a 350 million-year-old fault line from Laura on Cape York to south of Greenvale, west of Townsville. Sometimes the caves open up into daylight sections, where a hole has broken open on the ceiling and collapsed, and shards of light spark rainbows off stalagmites and stalactites as if in a coloured Cathedral.It is a Lost World: An awesome subterranean wonderland. Jagged chunks of limestone jut out of the ancient sea-bed plains and extend deep underground in a three-dimensional maze of passages, tunnels and shafts. Under these daylight holes, are often "bone sinks", where creatures have fallen in and died and are found in layers in the sediment, dating back at least 100,000 years. These are the secret fossil "gold mines" of outback north Queensland. To a tight-knit clan of scientists, cavers and indigenous elders it is obvious why exact locations of some sites must be kept secret. 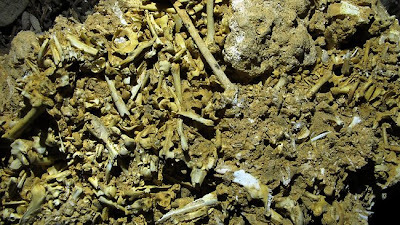 Winfried Weiss, of the Chillagoe Caving Club, said: "Fossils are big business. Imagine how much a fossilised crocodile skull would be worth?" "It is kept a secret because a lot of these fossil sites are extremely delicate. "If the location gets publicised, they might be disturbed by amateurs or treasure hunters looking for commercial gain. There are also sacred aboriginal sites to be respected. "We've known about the sites of the giant wombats, giant kangaroos and crocodile skull for about 60 years but have kept it a secret. "We don't want to disturb the scientific potential this place has to tell us about the past." In the jungles of South America, about 58 million years ago, a giant snake, weighing more than a tonne and 14-m long stalked the Earth,. Named Titanoboa, the colossal reptile found in Columbia in 2002 could swallow a crocodile whole without showing a bulge. After the extinction of the dinosaurs, it was the largest apex predator on the surface of the planet for about 10 million years.